Many perils await the travelers who venture beyond the villages and towns speckling the countryside. Among the greatest and most dangerous of these are ogres. Great, lumbering brutes driven by a need to gorge themselves on living flesh and warm blood, they constantly roam, seeking to stuff their gigantic maws with any creature too slow to escape their huge grasping hands or the deadly swing of their giant spiked clubs. Gobbling down their prey, they pay little heed to whatever fur, fleece, filth, clothing, armor, or weapons their struggling victims may have. They ceaselessly want—need—only to eat. And when they have swallowed the last of their meal, they let loose a thunderous belch and move on to find another victim to devour. In this installment of Monstrous Pages, Ghastly Gourmands examines ogres and all their awful kin. 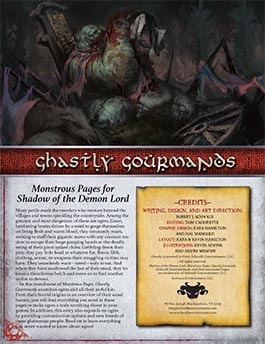 From their horrid origins to an overview of their usual haunts, you will find everything you need in these pages to make ogres a truly terrifying threat in your games. In addition, this entry also expands on ogres by providing customization options and new breeds of these gluttonous people. Read on to learn everything you never wanted to know about ogres! Buy Ghastly Gourmands as a PDF from Schwalb Entertainment or DriveThruRPG!